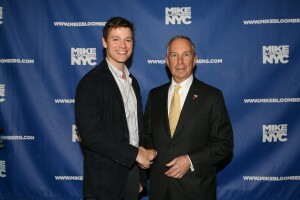 Last week I attended an LGBT event for Mike Bloomberg’s re-election campaign after I got done teaching a free SAT class at the LGBT Center in the West Village (it was an LGBT kinda week, folks). There are many things I love about our dear mayor but one of the things I love most about him is the fact that he’s totally loaded. There are obvious reasons why this is a good thing: he won’t bow to pressure from special interest lobbyists cause he doesn’t need their support, he knows how to successfully run a company and keep it on budget, etc. I’m not terribly interested in these reasons. What I like are the events. And there are lots of them. A bbq on the lawn of Gracie Mansion to kick off Gay Pride Week? Oh yeah. Random sightings at Toys for Tots (a notoriously homo event, in case you were wondering…). Um hmmm. Boozy woozie at City Winery hosted by Isaac Mizrahi and Cherry Jones? Score! City Winery was a great place to have the event because they have wine…on tap. Like beer. Except its wine. Loves that. There were lots of attractive gays and some of them flirted with me which helped my self esteem to rise, as if on an eagle’s wings, to new and lofty heights. I felt empowered, emboldened to…wait, where was I? Oh right, the booze. So yeah, these events are amazing. They are not, however, flawless. Here’s my gripe: I’ve had my picture taken with our good mayor many, many times. In every picture I look fabulous. Bloomie looks like he’s about to get mowed down by a speeding taxi. Can his handlers work on this? Its kinda embarrassing. Thanks. LOVE Bloomberg! Why don’t *I* have my picture taken with him??? Oh right, because he rarely comes to my house in Queens when I am sitting on the couch in my underwear, nursing the baby. That is *my* gripe with him.